AAA Report: Who's benefiting from New Jersey's declining gasoline sales? New Jersey residents awoke this morning to a tax on gasoline that was 4.3 cents higher. This was a result of the legislation passed in 2016 that hiked the gas tax by 23 cents per gallon but also authorized the state’s treasurer to increase the tax to make up for any shortfall caused by declining sales. Last week we told you of the 23% decline year over year in gas tax revenues during the month of August and that this marked the 10th time in 11 reporting periods the revenue generated by the gas tax fell below the same month a year earlier. This has also resulted in some New Jersey gas stations reporting sales declines of 25% that are clearly impacting their businesses. So, who is benefiting while New Jersey motorists and small businesses are hurting? According to a report issued by the American Automobile Association – Mid Atlantic (AAA) we should look to our neighbors in Delaware and Pennsylvania. According to data from the Oil Price Information Service (OPIS) and AAA, the percentage of taxable gasoline sold in New Jersey (out of all taxable gas sold in New Jersey, Pennsylvania, and Delaware) dropped from an average of 43.68% to 41.98%, about 17.7 million gallons less per month in 2017 than in 2016. 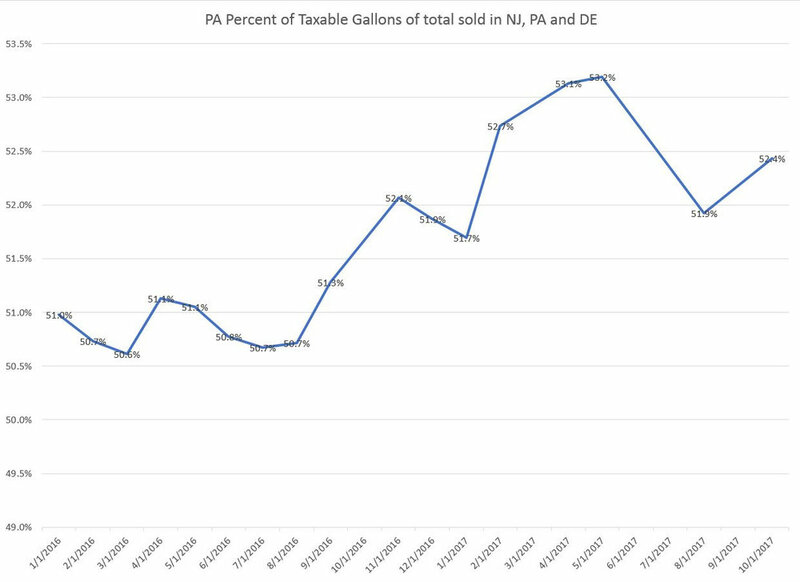 Meanwhile, the amount of taxable gas sold in Pennsylvania and Delaware both rose in 2017, an average of 7.48 million gallons a month in Pennsylvania more than the average amount of gas purchased in 2016 and more than 208,000 gallons a month in Delaware. New Jersey, which for many years boasted a gas tax among the lowest in the nation, has now skyrocketed to 41st. Clearly the increase has cost New Jersey a competitive edge against our neighbors. Today, gasoline prices in Pennsylvania are highest in the region, with New Jersey prices coming in at 10 to 15 cents less, and Delaware prices anywhere from 10 to 15 cents lower than New Jersey. As the gap between Pennsylvania and New Jersey continues to close, there is no doubt that Garden State will continue to see a decrease in Pennsylvanians crossing the border to “fill up” accompanied by a decline in interstate truckers and travelers patronizing gas stations in our state and drivers passing through on I-95 will likely fill their tanks in the Delaware before hitting the New Jersey Turnpike.